Inder Loves Folk Art: Cupcakes. When your three year old digs the muffin tins out of the cupboard, brings them to you, and asks you to make "brown cupcakes" with "candy spinkles," what choice do you have? After I had dug the double boiler out of the back of the cupboard and started melting chocolate, Joe suddenly changed his mind and decided he wanted "white cupcakes" instead. 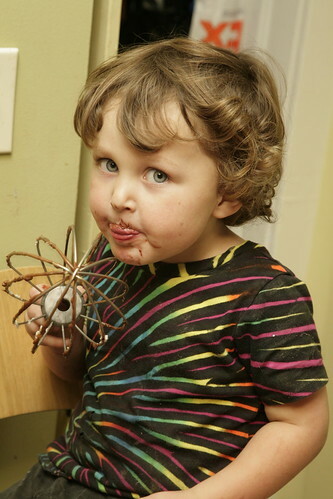 Luckily, he came to his senses when I passed him the whisk from the buttercream frosting. 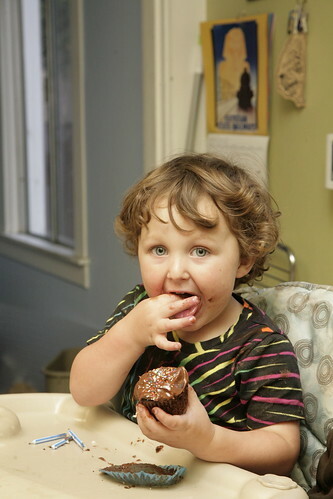 Believe me, child, when it comes to cupcakes, "brown" is so much better than "white"! Disaster averted! Then we decorated the cupcakes. 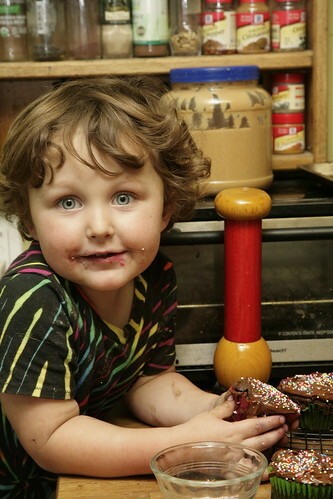 Joe helped apply the frosting and of course, the "spinkles." Some of the spinkles did not make it onto the cupcakes, as you can see. We're not going to get any awards for presentation for these, but we had fun! I used the "Dark Chocolate Cupcake" recipe from Cooks Illustrated (you need a subscription to view their recipes, but I gotta say, we get our money's worth from our Cooks Illustrated online subscription and I heartily recommend it) and topped these with dark chocolate buttercream frosting made using their "Easy Chocolate Buttercream" recipe. They turned out very dark chocolate-y, as promised, and delicious! Joe insisted on putting candles on his cupcake. Three blue candles. Because he's three, of course! So we all sang "A Very Merry Unbirthday To You!," he blew out his candles, and then he tucked into his cupcake and pronounced it "nummy nummy!" Yummo!!! 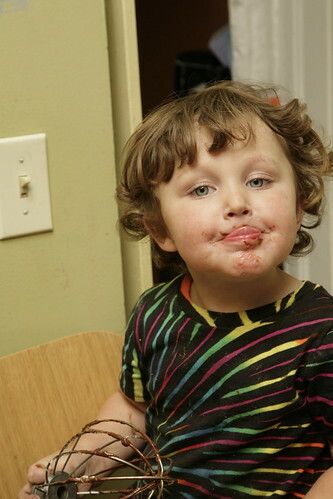 What's cuter than chocolate icing face!!! 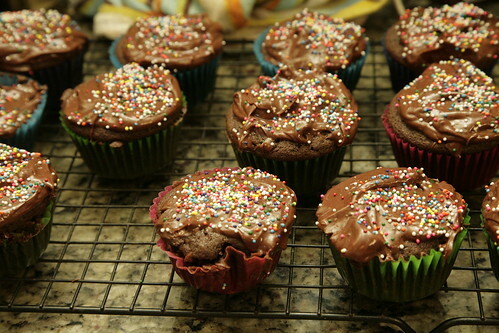 Yeah, I mean how can you say no to brown cupcakes?! Bonus points for wearing a mama made shirt that matches the sprinkles! Brown is way better than white! So cute and yummy! I think you might just win mom of the year! Oh oh oh! Mercy! Love this story, love Joe and you, and Rebecca. And the shirt! Oh yea once they get the brown cupcakes you'll be making them every other day :) the dark chocolate frosting sounds divine! Good to see he likes dark chocolate already. He looks like he's loving it and the cupcakes look delicious. Yummy! But I'm kind of distracted by that overly large jar of what can only be peanut butter?!?! As a Brit living in the US, I have a daily peanut butter-related story to tell (usually, the US over-zealous use of, kind)and if that really is peanut butter in that jar, that's my story for today. It's bigger than Joe's head! (For the record, I love peanut butter. On toast. Not with jam, jelly, chocolate, banana or honey or with anything else you crazy Americans put it with). Haha! It is peanut butter. That container is awfully large, we got it at Cosco (where they sell giant containers of everything). Which is to say, it's super huge even by crazy American standards, where cars, sodas, people, and jars of peanut butter come in super large sizes. Hee hee. But honestly? The lack of peanut butter is one reason I could never survive long in the UK ... :-) I eat so much PB&J while pregnant, it's no wonder Joe loves the stuff too.